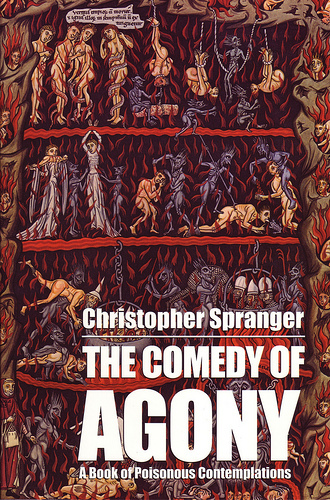 Christopher Spranger, The Comedy of Agony, Leaping Dog Press, 2007. 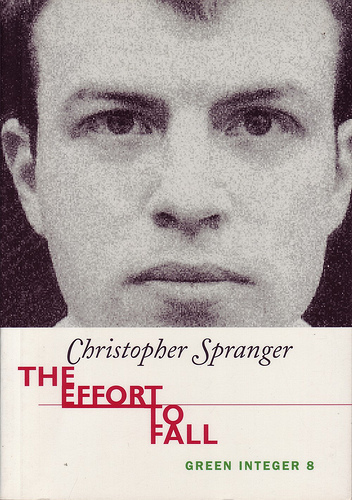 Christopher Spranger, The Effort to Fall, Green Integer, 1998.
pleasure of being neither them nor ourselves. Sight allows us to slip between the weight of our own being and that of the world and to unwind in the emptiness between them. Crucifixion is a piece of extravagance which only a god of Christ's caliber could have gotten away with. Could a Jupiter or a Vishnu have retained his clout nailed to a cross? The ultimate thief, music steals from us our dreams, our emotions, and our memories, and then disappears without a trace. After spending the day in solitude, you desire to go out in the evening with friends, and after going out in the evening with friends, to spend the rest of your days in solitude. The more debauched one becomes, the more one's fantasies revolve around chastity. God does not have the monopoly on omnipresence: this is a privilege enjoyed by Injustice as well. The writer, making every effort to appear innocent and noble, takes his revenge with the pen; while the murderer, less hypocritical, takes it with the sword. "Would you like to add any remarks concerning your forebears and fellow practitioners of epigrammatic exposition? - Anyone who sits down and tries to reduce the chaotic contents of his uncontrolled mind to a few meaningful sentences is insane. Are you still trending towards somewhat larger textual formats? - I sometimes consider writing in a more expansive way but words frighten and overwhelm me. When most of them have gone and only a few remain I feel relieved. My ambition-—assuming it can be called that-—is to write a book from which the words withdraw, yielding dominion to blank space. What do you see as the future of mankind? - The future of mankind is something I'd rather not see. Supposing it has one, nothing else does. Do you view the world from an Ecclesiastes-like perspective, or do you see it as evolving? Everything is just an extension of the original question, including the answer. On the subject of transmigration, a noted scholar writes: "One Indian philosopher took the relatively optimistic view that all, fools and wise alike, would find release after wandering through eight million four hundred thousand births." It is not often that one comes across words that inspire so much hope. The machine is in the process of making slavery universal and work perpetual. But even Aristotle predicted it would make slavery unnecessary, the ancient philosopher as deluded on this point as the latter-day utopian. Coming from a tradition more conscious of the Satanic restlessness at the heart of our species, a tradition in which doing nothing receives its due as an unrivalled accomplishment, could an Eastern sage have made the same mistake? Zhuangzi's farmer, confronted with the student’s labor-saving device, laughed derisively--and with each passing day we are in a better position to understand why. To the friend who mentioned that Gibbon celebrated the completion of his thirty-year task by taking a walk in his garden, I replied that I couldn’t imagine a better way of celebrating it—aside, perhaps, from sitting silently for several hours before a wall. After which it occurred to me that Bodhidharma, the founder of Chan Buddhism, is said to have sat for nine years before a wall. I wonder what he was celebrating? Nothing is so much in need of a good wrinkling as that which has been perfectly ironed. I often think of how Nietzsche ran up to that donkey which was being whipped and threw his arms around it protectively, sobbing. With this one gesture he managed to express everything he'd already expressed before in his books—but now he was communicating so plainly, so directly. The carnival mask had come off. Anyone who wants to see you succeed in his way, not yours, wants to see you fail. Randomly opening the Huainanzi, I read: "If you follow limited examples and do not know how to travel through heaven and earth, you could not be more confused." No way to grasp it. No way to respond. Enraptured by a truth beyond my reach, I shut the book."